AS-Interface modules of the MASI67 and MASI68 series allow cost effective solutions in the decentralized periphery of machines and systems. The modules are fully potted which makes them suitable for application in a harsh industrial environment. Depending on the type of module four or eight M8 or M12 ports are available for connecting sensors and actuators. The double pin assignment of the output sockets provides additional rationalization potentials. MASI67 modules are designed for very simple and cost effective installation. They are connected to a profile cable by means of polarity safe insulation displacement technology. Thanks to coding elements it is possible to insert the profile cable from both sides. This reduces the installation efforts. The basis is a standardized base plate. 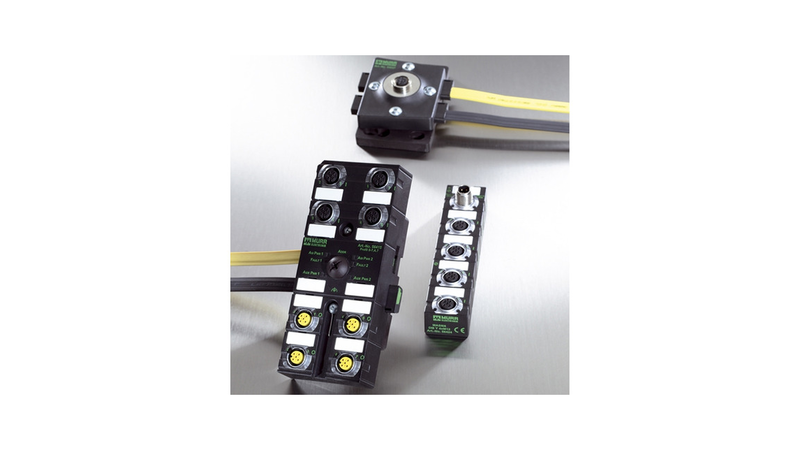 End caps allow sealing of the profile cable in the modules in a way that suits industrial needs. For applications with increased requirements such as reduced space, intensive stress by shock and vibration or influences by coolants or lubricants Murrelektronik offers modules of the MASI68 series with M12 system connections. They combine well-established connection technique with high functionality and small space requirements. With the M12 interface for data and power supply they use a proven wiring concept. Both the MASI67 and the MASI68 modules are produced according to the AS Interface specification 3.0. Murrelektronik also offers MASI solutions for safety-related applications up to safety category 3. With these TÜV certified modules it is possible to realize two electrically isolated emergency circuits per module.